Mari was born in 1975 in Hyvinkää. She began her studies in environmental design after graduating from high school in 1995. Shortly afterwards she changed her major to spatial and furniture design and started her studies at the Univeristy of Art and Design Helsinki. Alongside her studies, Mari has been working on a variety of different interior design projects. She worked as an assistant for the well known and awarded Finnish interior architecture office KOKO3 for a number of years. Recently she has been working as a freelance designer. Anna Katriina was born in 1977 in Kuusankoski. She started her studies at the University of Art and Design Helsinki in 1997 and is finishing her master studies at the Department of Spatial and Furniture Design. Anna Katriina has been working as a freelance designer for many years alongside her studies. Currently she is working as a full-time designer at Skanno, a well known Finnish store designing and selling furniture and interiors. 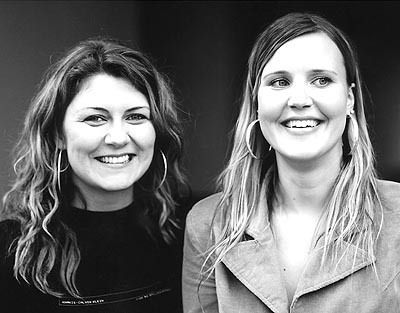 Together Mari and Anna Katriina have a design company called Perhonen (Butterfly in Finnish). The duo met during their studies at the University of Art and Design Helsinki. Since the start of their studies, they have been working together on a wide variety of different projects and competitions for which they have been awarded many times. They have exhibited abroad both with Imu design and on their own. Their designs were selected for the annual Sotheby´s contemporary art and design exhibition held in London in 2003. Recently their work was exhibited in Tokyo in an exhibition of new Scandinavian design. The exhibition was curated by designer Harri Koskinen and held at the Issey Miyake Design Studio Gallery (MDSG). Their Anemone table won the “best in furniture”-category in the Elle Decoration UK Furniture Awards 2003.